SAP Screen Personas tutorial shows how to set default selected value of a dropdown list control on a Personas flavor by using OnCreateHandler event using script button. 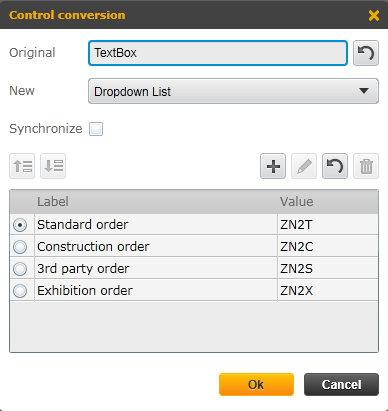 Although SAP Personas flavor dropdown list control is created with a predefined default selected value during execution the dropdown field is displayed as empty. To overcome this problem and show default value in the dropdown list control on the SAP Personas flavor, I will show developers how they can use script button and OnCreateHandler. I have used a dropdown list control on a SAP Screen Personas flavor. Although I have defined a value as default selection, unfortanetely the preselected value I have set is not displayed as I expected when I execute the flavor transaction. Here is the flavor control dropdown list configuration. On VA01 transaction flavor, I set the standart order as the default value of the dropdown list control. To set default value, normally checking the option box on the left side of the dropdown list item is enough. Unfortunately, in this case when the flavor is first displayed the default value is not displayed as the selected value. The default displayed value on the dropdown list is an empty value which we do not want. In order to solve this problem which prevents displaying default selection of a dropdown list control on a SAP Personas flavor, first create a new Script by adding script button on the Personas layout. Add the following user action into the steps of the script button which sets the selected value of the dropdown list. ABAP developer should replace the control "ses/wnd/usrUSRAREA/ctxtVBAKAUART" with the target dropdown list Personas layout control. Using "Enter Value" action, the selected item value of the dropdown list can be provided. As last step, copy the id value of the script button control. 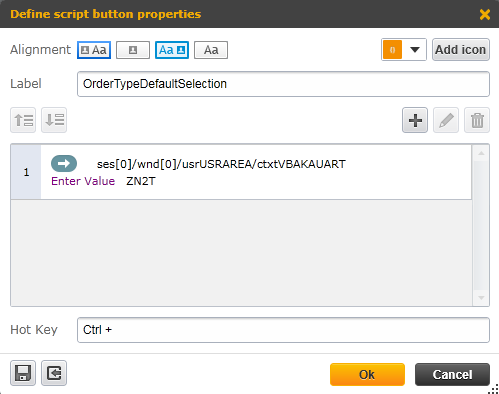 Then paste the script button id into the OnCreateHandler attribute of the layout user area as seen in below screenshot. Finally, hide the script button since the execution will be controlled by the page load event of the Personas flavor. OnCreateHandler event of the Personas layout user area will enable SAP Screen Personas developers to execute a default script when on page load event of the layout automatically. Afterwards, everytime the flavor is called or executed, the dropdown list will be shown with predefined value is selected by default as follows. On fortunately, if you have copies of this flavor for example for the purpose of different country implementations, etc all flavors should be updated manually for the target default values of the dropdown list flavor controls.